God baked the cake and Devil threw in the calories… this is one of those undeniable truths that lovers of all things tasteful have to bear at the back of their heads when approaching their favorite food. If you are making your taste buds happy, it will not be long before your GI system along with by your mirror begins to protest after a certain short period of time. As per facts, if you consume one slice of any ordinary cheese pizza (12 inches) of ordinary crust, you are sure to load yourself up by 230 calories. If you eat the entire pizza, multiply the figure by 6 and be prepared to get shocked. If you are eating a 16 or 18 inch pizza of the same category, add about 170 to 200 calories more to the mentioned figure. Considering the fact that you don’t always have the plain cheese pizza and tend to top with a variety of tongue tingling meat, certain veggies, ketchup and condiments, chances are remote that you will pile up anything less than 700 to 1000 calories every time you order one home. Also considering facilities like being able to choose your own topping while ordering, there is actually no end to what you could do to your health by the end of the pizza passion. 1) Right crust size – To begin with, if you wish to cut down on your pizza calories, try to make a shift from the usual crust to thin crust. This way you could take away about 30 to 50 calories of a 12inch pizza and more in proportion from the larger ones. 2) Right crust ingredients – This is perhaps the most important factor that can cause the most effective calorie melt down in pizzas and is best achievable when you are making it at home. Firstly, you could substitute the usual dough with whole wheat and mixed gain dough. This will cut down the calorie content by 30% to 40% if not more. 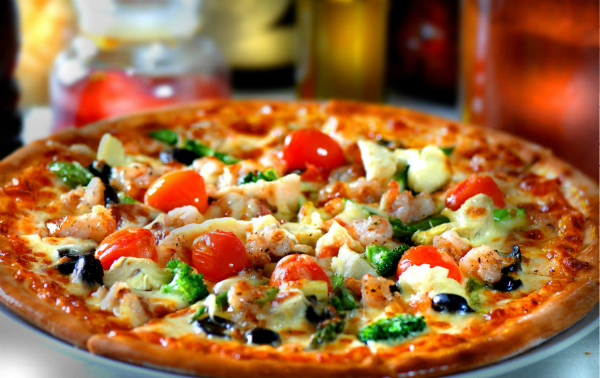 3) Right topping – While choosing topping for your pizza, try going easy on the cheese and mayonnaise. Try to get these ingredients in low fat or skimmed form. Substitute protein options like pork, ham, sausage, beef, and lard laden meat with leaner and healthier options like chicken, tofu, cottage cheese etc. This way, you can unload about 80 to 100 calories (if not more) from the pizza. Vegetables are important when it comes to calorie counting. So, you can choose from a range of colored vegetables like bell peppers, butternut squash, capsicums and others of the sort. Going easy with ketchup, sauces and dips is just as important. Besides the mentioned, it is imperative that you control your consumption. Try setting aside specific days of the week for gorging on foods as such while dedicating the rest to simple home cooked meals. This way you will not only get to satisfy your craving but be in great shape as well.